I write this at the end of a busy weekend for the church of St Mary de Crypt, with a big smile on my face, now that the public has finally been able to see all the hard work that has gone into the Discover Decrypt project. A quiet corner for prayer and reflection inside the main church, where anyone can go to pick up leaflets on the benefits of praying for mental health and serenity was one of my personal highlights. Having already written about sneak peeks that I’d been fortunate enough to have before the official re-opening this weekend, there was plenty left over to surprise and delight me at the church’s Open Day Event on Saturday March 23rd. I have written a lot about the potential the church space could have for events and community gatherings, but as I walked around the church on Saturday morning, what really struck me was the ease and comfort of places set aside for private worship and reflection. One such space, tucked in just beside the burial area of Robert Raikes, was a ‘prayer station’ with lots of information about how to pray and the benefits of Christian mindfulness. I made sure to leave my own prayer in the heart shaped tray, asking for the church to be blessed. Something about the act of writing down my thoughts on paper made my prayer feel more tangible and possible, and I hope the same will be true for other visitors who would like to share their own prayers this way. And for those of you who prefer to worship within the setting of a traditional service, the wonderful restoration of the church altar will not disappoint. 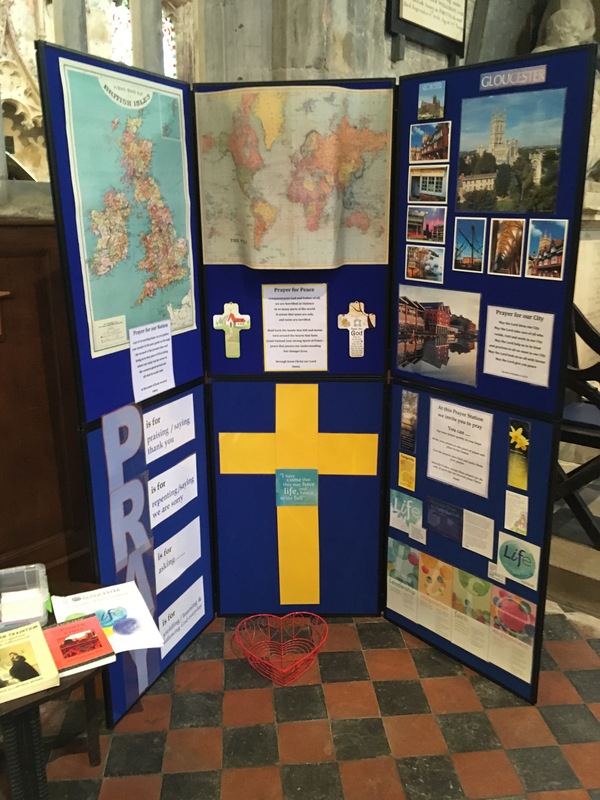 Some of the displays available in the main church opening, including the exhibition of the ‘wish bones’ made by local children. Away from the quieter parts of the building, I started to see a curious collection of people, apparent visitors from Gloucester past. These included a Medieval monk, a couple of Civil War gentlemen and an arresting Victorian couple, out to stroll the grounds in their finest Sunday dress. Far from hallucinating, what I was really seeing was some of the actors and actresses from local drama company Tyger Productions bringing some of the characters from the church’s history to life. The group was also there to promote an exciting production of Alice in Wonderland, to be shown at St Mary’s sometime in July 2019 (exact dates TBC). Auditions for all roles will soon be taking place, and the group welcomes any budding thespians to come along and try out. For more information, please see their website: http://www.tygerproductions.co.uk/. 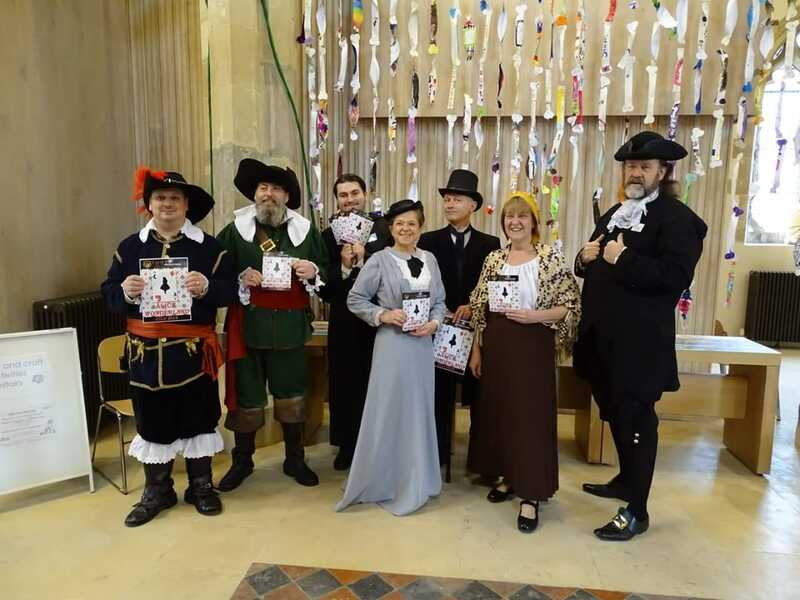 As well as these theatrical volunteers, there were photographers, local artists and craftmakers, authors and patrons of the church, who all need congratulating on all the hard work that they put in to the event. If you missed the opening but want to come along and see the finished project, the church will be open again from Wednesday-Sunday, so please come along. And finally, the Discover Decrypt project is always grateful for volunteers who can offer their time now that the church has re-opened. For more information please our website: https://discdecrypts.wpengine.com/volunteering/. Maybe it’ll be your event I’ll be writing about next! Until next time – Zoe.